• The BASH Is Here! 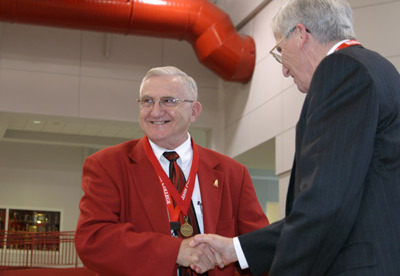 Thirty-seven members of the 50th reunion class attended the banquet, where each was honored by receiving his (or her) 50th reunion medallion. Louise Coleman received the honor for her late husband, Dr. Bill Coleman. The evening began with a cocktail reception, but Director of Alumni Affairs Tom Runge ’71, serving as master of ceremonies, kept things moving along throughout the evening. President President Ford, in his remarks, gave alumni a nice year in review talk, plus discussed his pending retirement from the College and detailed how the search for a new president would go. Alumni from as far back as the 1940s through 2000 returned for the banquet; they came from as far away as Tokyo, Japan and Paris, France to as close to just across town here in Crawfordsville. The evening ended with a stirring rendition of Old Wabash, led by Mike Patterson ’55. Pictured above is Vaino Grayam, Class Agent for the Class of 1955, as he receives his 50th reunion medallion from President Ford.